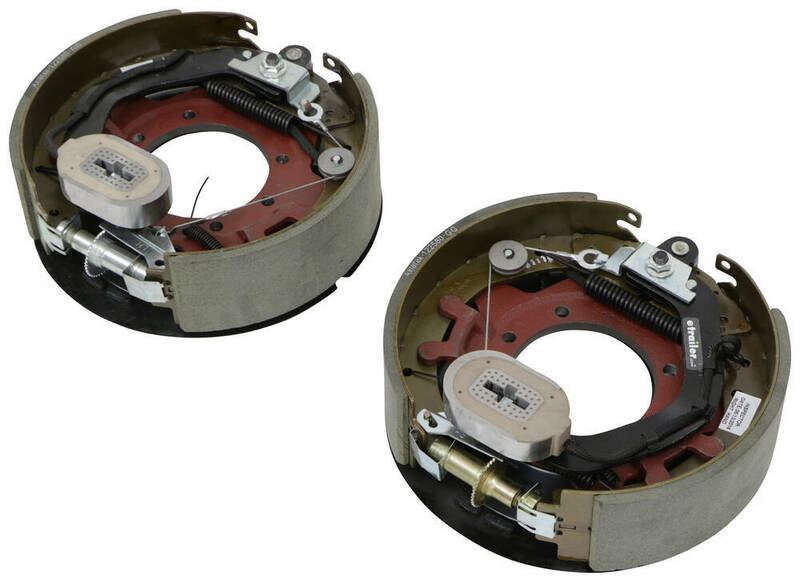 Self-adjusting electric brakes measure 12-1/4" x 3-3/8". Brake pads are made of durable friction material for improved braking. E-coated backing plates resist rust. Dust shields protect from debris. Fit 15" or larger wheels. 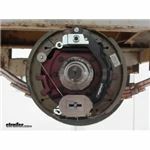 Lowest Prices for the best trailer brakes from etrailer. 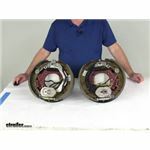 Electric Trailer Brake Kit w/ Dust Shields - Self-Adjusting - 12-1/4" - Left/Right Hand - 10K part number AKEBRK-10 can be ordered online at etrailer.com or call 800-298-8924 for expert service. 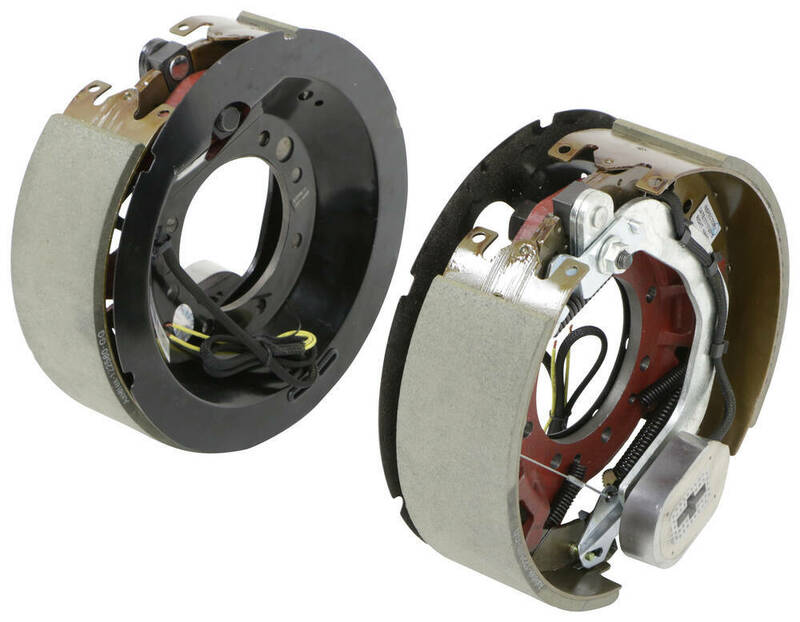 12-1/4" x 4" Driver's-side and passenger's-side electric trailer brake assemblies fit 10,000-lb axles. Mounting flanges have 7-bolt pattern. Self-adjusting brakes require little maintenance. Fit 16" or larger wheels. Order: RelevanceNewestRating - High to LowRating - Low to High Self-adjusting electric brakes measure 12-1/4" x 3-3/8". 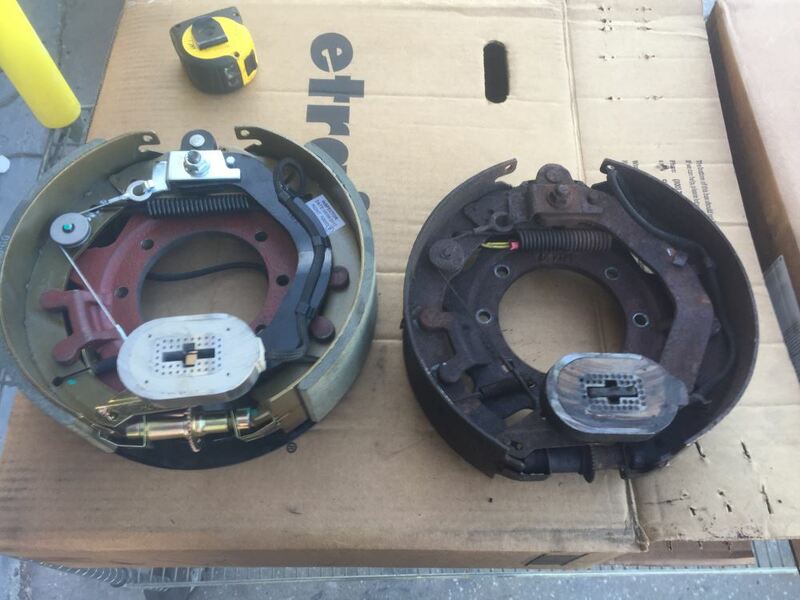 Brake pads are made of durable friction material for improved braking. E-coated backing plates resist rust. Dust shields protect from debris. Fit 15" or larger wheels. For your Dexter drums that take assemblies that are 12-1/4 inch by 3-3/8 inch our etrailer.com brand asssembly set part # AKEBRK-10 is a confirmed fit and will save you money over the Dexter kit # 23-450-451. These are both kits for 10k axles. If instead you have 8k you'd need # AKEBRK-8 for etrailer.com brand and # 23-434-435 for Dexter. The size brake assembly you mentioned of 12-1/4 inch by 3-1/8 inch is not a standard size for a 10k Lippert axle but it's pretty close to standard sizes in width. The diameter of 12-1/4 inch is fine but the widths typically are 3-1/2 inch or 3-3/8 inch. What it looks like you have is the AxleTek or etrailer.com assemblies part # AKEBRK-10 based on the picture you submitted. Which for that you could use the magnet part # BP01-301 for. The brake assembly kit you want is the part # AKEBRK-10 which comes with two self adjusting brake assemblies for the size you need of 12-1/4 inch by 3-3/8 inch. I attached a review video for these assemblies for you to check out as well. 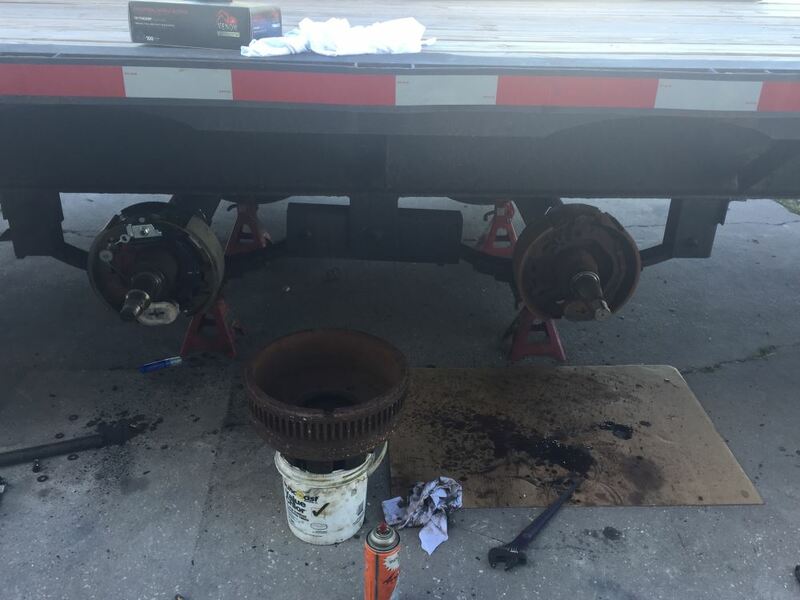 I went out to our warehouse to measure the Dexter Trailer Brake Drum # 9-44-1 drum for you. From the inside wall to the inside lip the measurement is 4-1/2 inches where it will come to the dust shield of the brake assembly where it mounts to the axle flange. 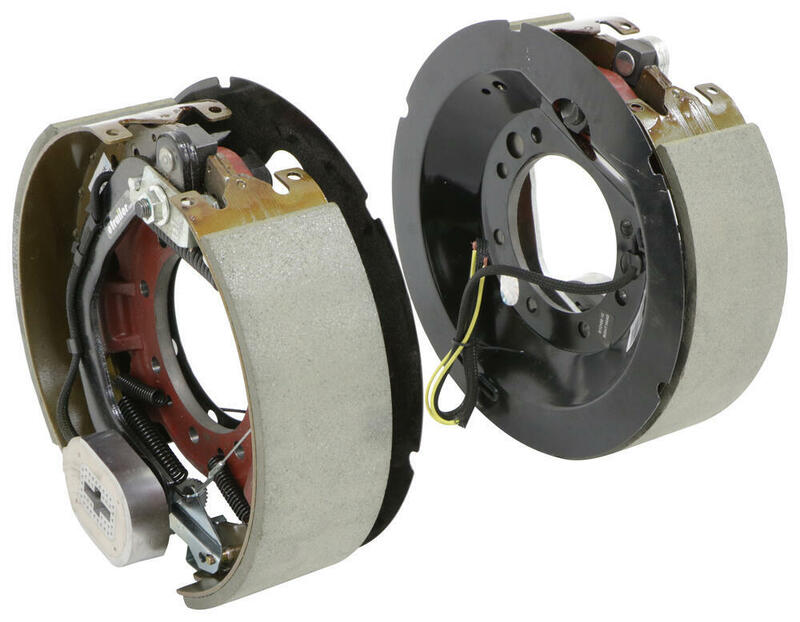 The brake assembly I recommend for that hub is the Electric Trailer Brake Kit w/ Dust Shields - Self-Adjusting - 12-1/4" - Left/Right Hand - 10K # AKEBRK-10.